I had an interesting conversation the other day. It was about philosophers who seem to defend bizarre or controversial views. Unsurprisingly, David Benatar's name came up. Benatar, in case you don't know, is an anti-natalist. He thinks it is wrong to bring people into existence (i.e. to procreate) and he presents his view in a book called Better Never to Have Been. He's not the only anti-natalist, but his book seems to have gained a high level of notoriety, perhaps given its publication by Oxford University Press. Based on my reading, this seems like a fair, but critical philosophical analysis of Benatar's book, and I want to summarise some its content here. 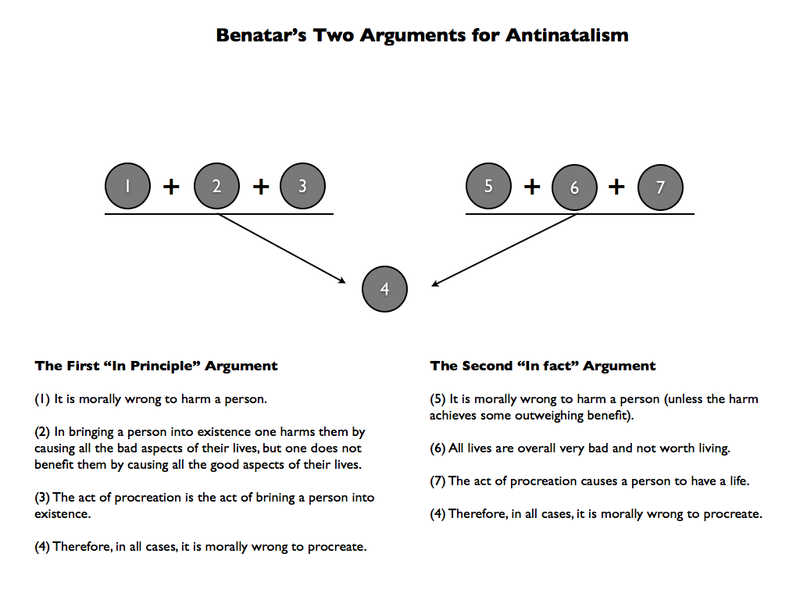 I'm also going to use it as my basis for trying to clarify Benatar's arguments to myself. Obviously, the kind of analysis I'm going to undertake isn't a replacement for reading Benatar's original work, but what with time constraints and everything I think it is a reasonable place to start. Before I get started I want to draw attention to one point. I don't find anti-natalism as counter-intuitive as some people I have spoken to seem to do. Indeed, I suspect there are many (actual) cases in which procreation is morally circumspect, particularly if it is done without proper foresight and planning for the child's future. That said, I do find it hard to accept that all cases of procreation are morally circumspect and that existence is, in general, awful. Anti-natalists would have to do a lot to convince me of this. Let's see if Benatar, filtered through the lens of Elizabeth Harman, is up to that task. 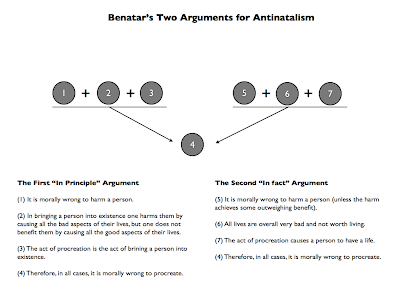 In this first part, I'll just introduce Benatar's two arguments. I'll try to evaluate them in the second part. Benatar defends one basic conclusion using two, independent, lines of argument. The conclusion, as was hinted at above, is that procreation is, in all cases, wrong. What are the arguments? We'll develop versions of each below. Initially, we can note that both arguments rely on the generally accepted principle that it is wrong to harm someone (although they might, as I will suggest, interpret that principle in slightly different ways). This principle has an obvious corollary, namely: it is morally right to benefit someone. (1) It is morally wrong to harm a person. (2) In bringing a person into existence one harms them by causing all the bad aspects of their lives, but one does not benefit them by causing all the good aspects of their lives. (3) The act of procreation is the act of brining a person into existence. (4) Therefore, in all cases, it is morally wrong to procreate. Obviously, premise (2) is pretty crucial here and we'll have to see what kind of argument Benatar can construct in its favour. One other thing to note is that in this argument the harm principle is phrased in a categorical or absolute way - i.e. "it is never right to harm a person" - instead of in a non-absolute or consequentialist way. I'm not sure, based on this one article, whether Benatar would agree with this reconstruction of the principle, but it seems appropriate given the kind of argument he offers in favour of premise (2), which we'll be considering later. That said, I think a non-absolute version could be substituted here without doing too much damage to our appreciation of the argument (mainly because it seems to have other, more serious, defects). (5) It is morally wrong to harm a person (unless the harm achieves some outweighing benefit). (6) All lives are overall very bad and not worth living. (7) The act of procreation causes a person to have a life. Although this argument is pretty easy to follow, a couple of things need to be said about it here. First, in her review, Harman says that Benatar only claims that "most lives are overall very bad". I have changed that, in my reconstruction of the argument, to "all lives are overall very bad". This comes in premise (6). I made the change for the obvious reason that without it the strong conclusion that Benatar reaches does not follow. At best, the conclusion reached would be that most cases of procreation are morally wrong (which, as noted in the intro, I might be willing to accept). Of course, this makes the argument more difficult to defend. Second, as you can see, this argument relies on a consequentialist version of the harm principle. This version makes sense given the kind of aggregative claim embedded in premise (6): if we were absolutists about the wrongness of harming someone then assessing the overall level of harm would not be a meaningful exercise. The consequentialist permission of some level of harm can be understood in different ways. In the argument given, all forms of harm are permitted if they lead to some greater good. This is a pretty weak requirement. A stronger version of the principle would stipulate that harm is only permitted if it is necessary for achieving some greater good. This should actually be familiar to anyone who read my series on skeptical theism and the problem of evil. There, the idea was that God could only allow whatever evils were (logically) necessary for achieving some greater good. Again, based on reading just this one article, I have no idea how Benatar would like the principle to be understood. I've opted for the weak version here. Again, as was the case with the first argument, I don't think this matters too much because all the real philosophical action lies elsewhere. Benatar's two arguments are combined and illustrated in the following map. Which argument is stronger? Obviously, the first argument because it is an "in principle" argument. It states that, given the conceptual nature of harms and benefits, it is necessarily wrong to bring a person into existence. If this is true, it would be impossible to disagree. This stands in stark contrast to the second argument, which is a contingent, a posteriori argument. It states that, given the nature of existence as it currently stands, it is wrong to bring a person into existence. The weakness here is twofold: (i) this is an empirical claim that could be quite difficult to prove and (ii) the contingent facts could change such that existence ceases to be so harmful (e.g. if certain transhumanist goals are obtained). 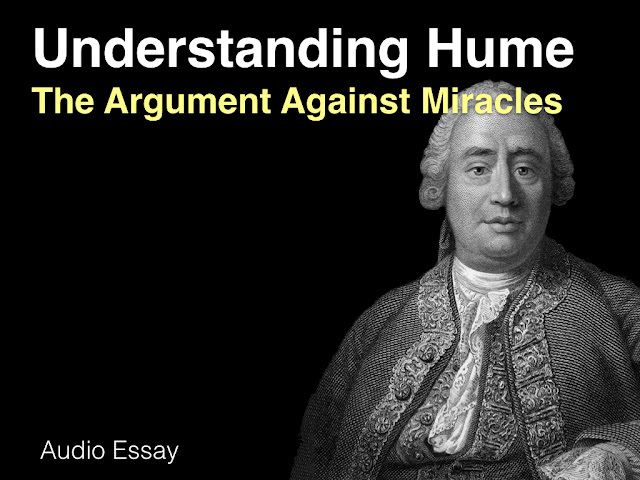 Given the relative strengths of the arguments involved, and the practical difficulty in evaluating the second argument in this forum, the second part of this series will focus almost entirely on the first argument. I'm amazed that people have the intellectual charity to engage with the argument on its own terms. 1. The second argument clearly requires some form of simple hedonism, or the view that "good" can be reliably equated with "pleasure" and "bad" with "pain". This assumption is almost universally rejected in moral philosophy. Why allow it to operate here? 2. Both arguments assume that your sincere judgments about the value of your life have no authority whatsoever, and that such judgments can be instantly overruled via rationalist conceptual analysis (1st argument) or empirical "studies" (2nd argument). Very few philosophers working in value theory would accept this idea, as most believe that an agent's sincere, reflective, factually informed value-judgments have at least some authority in this matter.